Wanna to recover ZIP password? 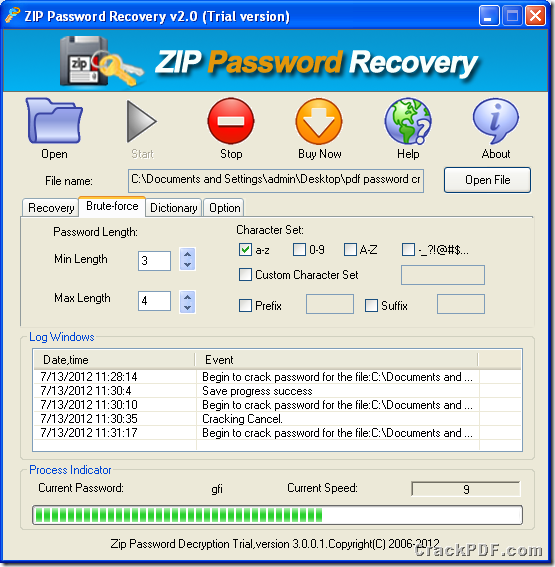 Crack PDF ZIP Password Recovery can help you recover password for your ZIP/WinZIP/PKZIP archives. ZIP archive is compressed file with multiple files, which is available for sharing with others or simply archiving old files for safekeeping. If you lost or forgot the password of the encrypted ZIP files, you cann’t get access to the the files inside the archive. 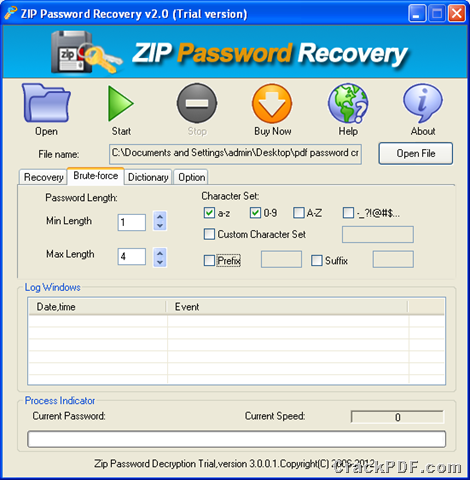 Fortunately, the password recovery tool- Crack PDF ZIP Password Recovery can recover the lost or forgotten password for encrypted ZIP archives. Crack PDF ZIP Password Recovery is capable of performing both brute-force and dictionary attack against the password-protected ZIP files to retrieve ZIP password. Please follow the guide below to see how to recover ZIP/WinZIP/PKZIP password. Please download the package of Crack PDF ZIP Password Recovery and save it in a place where you can easily find. After the download is complete, please double click the .exe file and follow the setup wizard to install it. Please launch the app and click the Open button on the top of the main interface or click the Open File button below “About” button on the main interface to add the password-protected ZIP archive file (*.zip). On this interface, you can set the mutation count and max password length after checking the radio box of “Mutation Count”. You can also add a new dictionary by checking the radio box of “Add Dictionary File”, and then clicking the “Select Dictionary” button on the interface. Click the Start button on the top of the main panel to start the recovery process. Now, you are able to open the password-protected ZIP archive with the recovered password. You can try Crack PDF ZIP Password Recovery to recover ZIP archive password via the following button. Wanna recover ZIP password? Have you met such a case:when opening a ZIP file, you are request to input a password, and you forget the password? In stead of racking your brains to recall, why not try CrackPDF ZIP Password Recovery to remove the restriction from protected ZIP files? 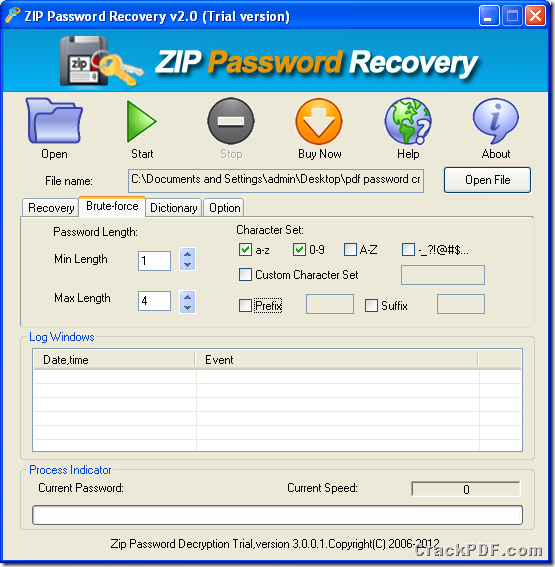 CrackPDF ZIP Password Recovery is a professional decryption tool designed to help users get back forgotten ZIP passwords if you forgot or lost the passwords of ZIP/WinZIP/PKZIP files.This tool provides three methods to recover ZIP password. 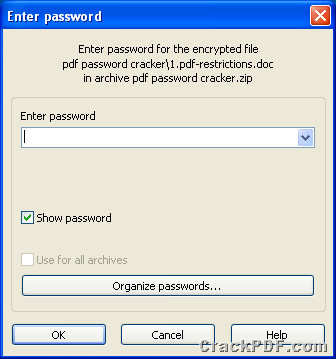 If you remember a little bit about the forgotten password, you can try the customizable brute-force attack.However, if you remember nothing about the lost password you can try the dictionary attack or the brute force attack with trying all combinations.With the help of CrackPDF ZIP Password Recovery, you can get access to the password protected ZIP files again. If you are blank about the password, let’s see how to use CrackPDF ZIP Password Recovery to recover the lost ZIP password. Step 1. Download and install CrackPDF ZIP Password Recovery into your computer. Step 2.Add the password protected ZIP files. You can click Open or Open File to add the ZIP files. Click the third radio box on the Recovery tab control > click the Dictionary tab> select options in the Dictionary tab control. If the dictionary-based attack still could not find the forgotten ZIP password back, then you may try the brute force attack with trying all the combinations.Switch back to the first radio box on the Recovery tab control> click the Brute-force with Mask Attack (Trying All Possible Combinations) tab. Step 4.Click Start button to start the process. It will be a difficulty to access a ZIP archive which is protected by a password. If you forget, lose or don’t know the password of the archive and you have to open the files extracted in the archive, you will need to crack ZIP password with some kind of program which has this kind of function. 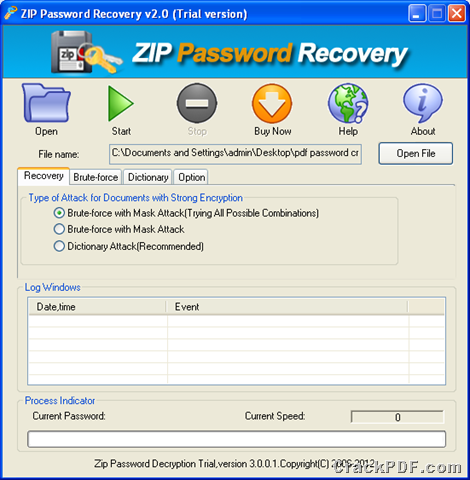 The program CrackPDF ZIP Password Recovery enables you to adopt three strategies to recover ZIP password, with the assistance of ZIP Password Recovery, you can easily get access to your password protected ZIP files again. For using the program, please download and install it on your computer. 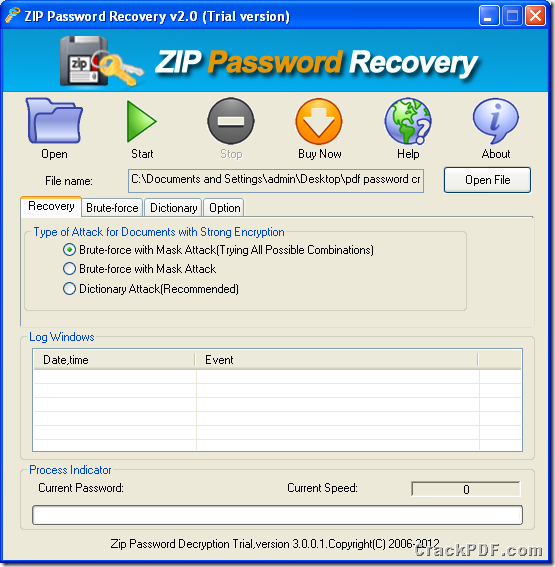 Open the program through Start menu and you will see the main interface of ZIP Password Recovery on your screen like the one shown in Figure 1. Then please do as follows to crack ZIP password. 1. Click Open button or Open File button to choose ZIP archive from the opened file picker window and the added archive path will be shown in the edit box beside the button Open File. 2. 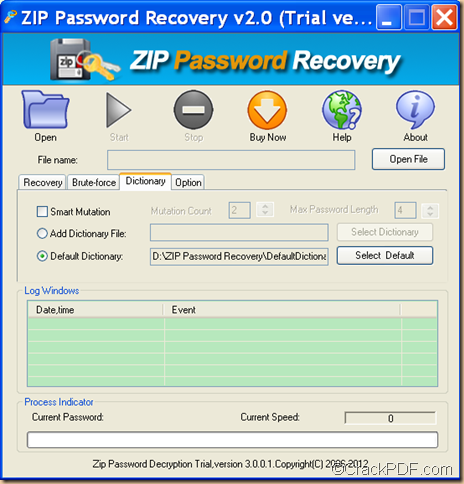 Choose a cracking method to recover ZIP password in Recovery tab. For example, you choose the way Brute-force with Mask Attack which enables you to specify the ZIP password as possible ones according to your memories. 3. The options in Brute-force and Dictionary serve for the cracking method Brute-force with Mask Attack and Dictionary Attack. If you have chosen the method Brute-force with Mask Attack, please click Brute-force tab and set the password max and min length, possible characters, etc. Please see it in Figure 2. 4. You can set some basic settings for the program if you click the tab Option in which you can set the auto-saving time for the program to save cracking state automatically. You can also choose the option Shutdown the computer after cracking finishes. 5. Start to crack ZIP password by clicking Start button and wait until the password is recovered. When the password is found, please save the cracked PDF in the popup window which is for saving target file. By clicking here you can visit the homepage of ZIP Password Recovery to learn more information like features, functions, etc. about the program. If you still have any questions about how to recover ZIP password, please click here to contact the support team of CrackPDF. ZIP archive can help you send and store files more easily and quickly and it is a format which occupies less space on your computer disk. If you want to view the documents in ZIP archive, you need to extract it to some location. But sometimes the archive is protected by password (Please see it in Figure 1) and you forget or lose the password. 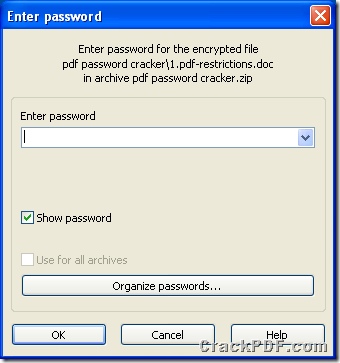 Now the program CrackPDF ZIP Password Recovery will help you recover ZIP password. 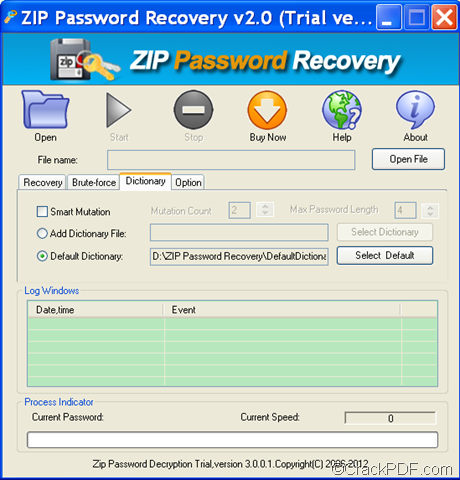 ZIP Password Recovery supports to remove the password in ZIP/WinZIP/PKZIP archives and it supplies three kinds of methods for your reference to remove ZIP password. By clicking this link, you can download the free trial version of the program to your computer and then you need to install it by following the setup wizard. Please open the program through Start menu or by double clicking the icon. 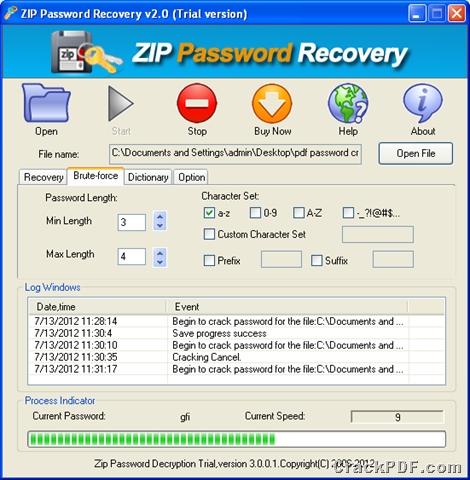 In the opened interface of ZIP Password Recovery which is shown in Figure 1, please add ZIP archive into the program by clicking Open or Open File button to choose the archive in opened file picker window. Then please choose a kind of password recovering method in Recovery tab. In Brute-force tab, you can specify the password minimum and maximum length, possible characters, etc. and the options in this tab serve for the recovery method brute-force with Mask Attack. In tab Dictionary, you can use the default dictionary file or add your dictionary file to recover ZIP password and the options in this tab serve for the method Dictionary Attack (Recommended). Then please click Start button to remove ZIP password and the application allows you to stop the current recovering state anytime by clicking Stop button. Of course, it can save the current state for you and you can restart it any time, too. Then the application will try all possible passwords for ZIP archive according to your chosen method until the password is found. The snapshot shown in Figure 3 is the state of recovering ZIP password. If you have any other questions about how to remove ZIP password, welcome to contact our support team. For learning more information about ZIP Password Recovery, please enter its homepage.